Crochet. I’m liking it. Simple stuff and very forgiving when you make all those beginner mistakes. Actually, I LOVE the pedicure socks. I’ve made tons for yoga and as boot socks(so one can wiggle toes.) I invented this pattern until I saw that others have also invented it. “Sigh.” I made them because I didn’t know how to do the heel for a sock, but what a great mistake. Cast on 8-11+ stitches. It should be a nice cuff height. Turn. *Single crochet into the BACK loop only of each stitch and add one chain. Turn. ** Repeat* to **. Do this until the strip fits comfortably around your ankle, about 13-15 “ribs”. 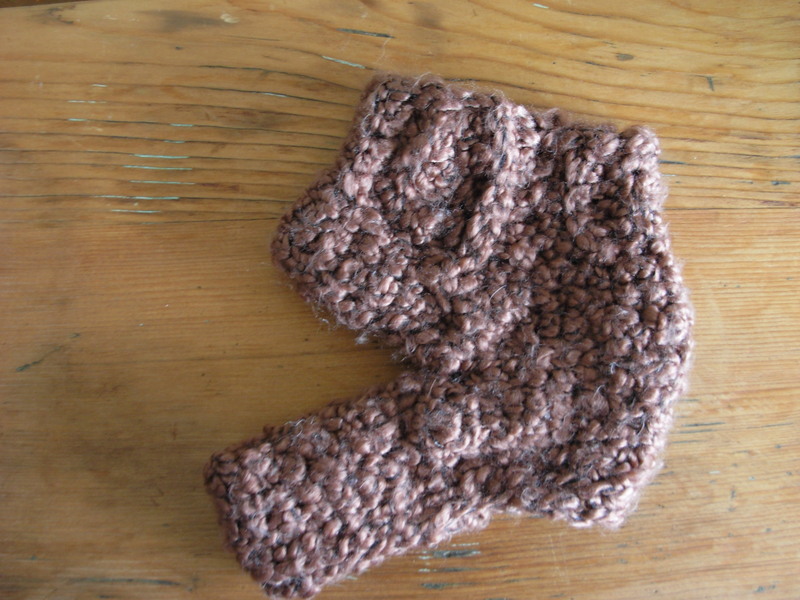 Slip stitch ends together so it looks like a ribbed bracelet. Add 2-3 bands of sc all the way around the cuff. Loosely chain 17-18 and attach the chain(be very careful not to twist the chain!) to the exact opposite side. Now it looks like a bottomless Easter basket. Single crochet all the way around your 17-18 stitches( this is the tough part) and then halfway around the cuff, until the width of your new loop is about 3 inches. Skip a stitch every so often if the band seems as though it is flaring. Weave in ends. Done! Yea! Congrats.